I don't have any money, but what I do have is a sequel, and a brand new trailer for it! It may not have been a critical success, nor anything particularly special, but 2008's Taken certainly was a financial hit that was enjoyed by people all over the world. Now Brian Mills (Liam Neeson) is back for another round of action in Taken 2. What happens in Istanbul, stays in Istanbul, but when retired CIA operative Bryan Mills and his wife Lenore (Famke Janssen) are taken hostage by the father of a kidnapper Mills killed while rescuing his daughter Kim (Maggie Grace) in the first film, he must use his "certain set of skills" once again to get out of his trickiest situation yet! 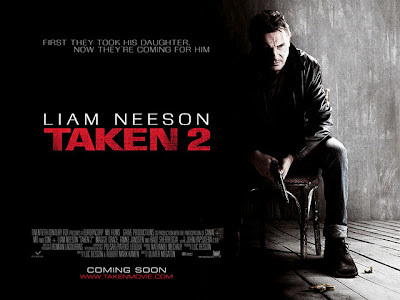 Taken 2 is released in cinemas across the UK on October 5th 2012. Are you Taken by this trailer, or has it left you unimpressed? Will it be a blockbuster or lacklustre? Leave your comments below!